If you are looking for the best dog for home protection, you came to the right place. According to Wikipedia article on guard dogs, both guard dogs and watchdogs bark loudly to alert their owners of an intruder’s presence and to scare away the intruder. The watch dog’s function ends here; a guard dog is capable of attacking, or restraining the intruder. We also made a list of 15 smartest dogs which you might find interesting. The German Shepard is widely recognized as a symbol for a guard dog. Yet, it is more of a pop culture image that we accepted than the true nature of this breed. The German Shepard`s most important skill is its ability and the will to learn. Therefore, if trained, a German Shepard can indeed learn to do pretty much anything, guarding included. All schnauzers, regardless of the size, share the same pack of character attributes. Eager to learn, energetic, agile, protective of what they hold dear, but above all – they are loud. Whilst miniature schnauzers will not do much help when it comes to guarding and protecting, the giant schnauzers most definitively will. The Beauceron shares a similar mindset of the German Shepard. These strong intelligent dogs have been used for herding the cattle, hunting and as a working dog in police and army. Happiest when given a task, if trained to guard – you may rest assured that everything will be in perfect order. Not only is the Bullmastiff a huge and strong dog that can weight up to 150 pounds and that can easily overpower pretty much anybody, but also what makes bullmastiff different from most other breeds is its character when it comes to understanding the concept of guarding. They are not famous for being much of a noise maker, yet in the situations that they perceive as threatening – with little to no noise, jaws that can easily crush bones come to the stage. 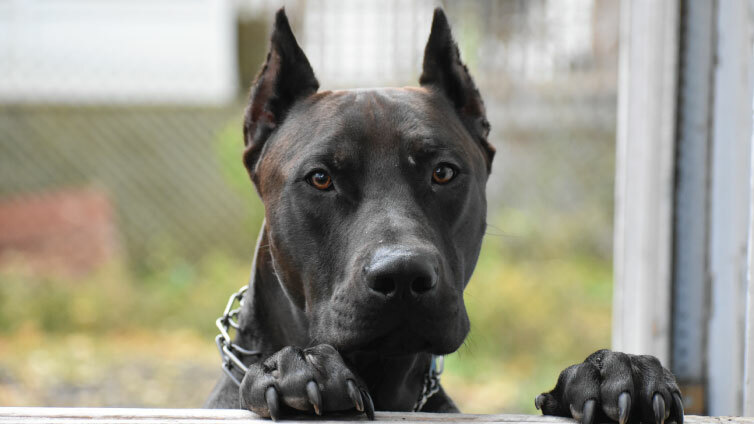 Unlike the German Sheppard that can become the ultimate guardian of you and your home through training, the Cane Corso is the breed that is genetically predisposed do guard. That, combined with the fact that we are talking about big and strong, loud dogs, can make the safety dream come true. Yet, if untrained they may become overprotective or even aggressive. Devotion to their owners can at the same time be the Rottweiler`s best and worst feature. High-obedience rates may come short when a dog perceives the situation as harmful to its master, even though in reality, it may be completely harmless. Therefore, these devoted giants need to be properly trained and socialized, especially with children. Unlike the Rottweiler, which remains focused on protecting, the Boxer is a true family dog. Devoted, playful and energetic, yet still very strong and capable of keeping an eye on the family and property, and more than capable to defend them. 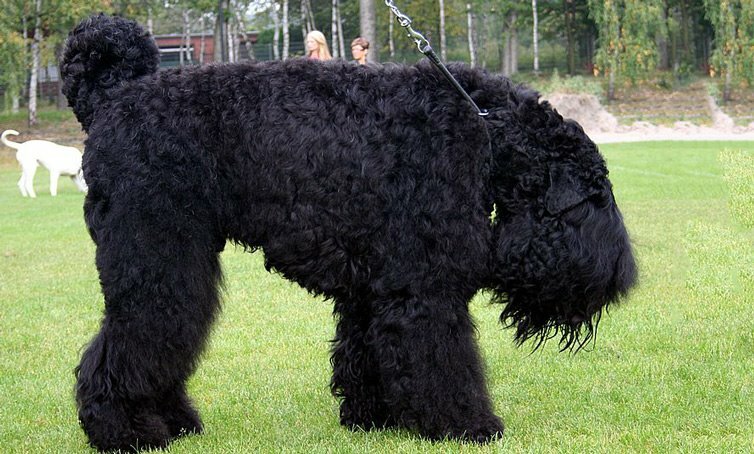 Black Russian Terriers are, it’s fair to say, some of the most amazing working dogs on the globe. What makes them so special is their ability to adjust to conditions that they are exposed to – they can be guard dogs like no other (to the level of cruelty), as well as cuddly family pets. Black Russian Terriers, opposed to their stunning beauty, tend to have a mind of their own, therefore in order to prevent instinctive aggression towards strangers, they need training. Do not underestimate this amazing dog`s ability to guard only because of its dreadlocks-like appearance. The Komondor was originally used for herding sheep and for protecting them from the wild animals. Unlike breeds that enjoy being given tasks, Komondors may appear stubborn in their instinctive need to protect what they hold dear even if told otherwise. The Doberman is a dog that is characterized with self-control and personal discipline like no other breed. Eager to learn, and even more, eager to fulfill the task to the very maximum of its potential, a trained Doberman is a guard dog that you can rely on in any situation. The Malinois is widely accepted as a dog breed that can be trained to do a vast spectrum of jobs. Eager to learn, easily trainable, with amazing body agility and sense of smell. Therefore, among other things, Malinoises can be perfect guards and dogs for personal protection. Originated from the mountains of Caucasia, these dogs were bred to endure long sharp winters and protect the farm and sheep from wolves and bears. Therefore, these dogs are not to joke around with. They can be THE guard dogs, yet it is hard to combine tasks for dogs with such strong instincts. If trained, they can be devoted family pets, but even then, when the protective instinct kicks in, the potential burglar is probably going to the ER for a long time. Rhodesian Ridgebacks were originally used to hunt lions. That information alone should be enough to provide you with an insight in what powerful, agile and fearless dogs Ridgebacks are. In the conditions that do not include hunting for lions, they are more than capable of keeping an eye on you, your family and hour home. Agile and devoted, the American Staffordshire Terrier can be a perfect family dog, yet the nature of a terrier is ever-present and the AST are constantly on alert, which makes them perfect and reliable watchdogs, more than willing to react in order to protect whom and what they hold dear. The American Bulldog originated from the Old English Bulldog. These dogs were generally used as working dogs that were often given the role of guarding the homes. American Bulldog definitely has a strong, muscly body that might seem dangerous to some. In combination with his very protective nature he really does make a great guard dog. At first sight this white, muscular dog might really seem like an aggressive dog you wouldn’t want to mess with. In fact, the Dogo Argentino was bred to be a brave and protective human guard dog, and was used in game hunting. Luckily, today they are not used in these rough games. An Argentino is a very intelligent dog that might be stubborn, so it would probably need an experienced and active owner. This 130-150 lb dog might not be a kind of dog you’d like to encounter unleashed and with no supervision. The Neapolitan Mastiff also called Mastino, is a large, powerful breed bred in Italy. His protective instincts make him a perfect guard dog that will always protect well its family and property. Despite their big and fearsome appearance, these dog’s do not bark a lot. They will rather sneak up on the intruders than alert them with barking. Early socialization of these dogs is necessary so that Mastino can learn the boundaries in games and in overprotecting his owners. At first, a Kuvasz might look to you as a Retriever, but apart from being a good family dog, they have traits that quite differ from the easy-going Golden Retrievers. Kuvasz, the Hungarian flock-guarding dog, is rather independent and might even be challenging to train. They are protective of their people and can be very suspicious of strangers. Being so large, they reminded shepherds of wolves, but were easily distinguished because of their white color. The loyal Akita is a large and fearless dog that comes from Japan. If seeing this dog on this list confuses you, then you probably haven’t heard of the royal history of this breed. Akitas were bred for guarding nobility in feudal Japan, and they often hunted wild animals. Despite being powerful guardians, they are still very affectionate with their owners. Akita will never let you down. 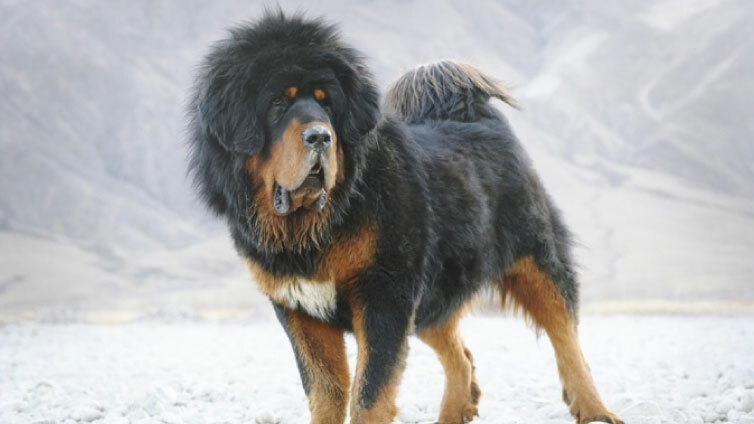 Tibetan Mastiff is one of the largest dog breeds out there. He is also known as “Nomad dog” because of his origins within the nomadic cultures of Tibet. This dog’s primary instinct is to protect, so there’s no surprise that he’s one of the best guard dogs you could get. In Tibetan local tribes, these dogs were used to protect sheep from wolves, leopards, bears and even tigers! With the Tibetan Mastiff, you can sleep peacefully at night. Šarplaninac is also known as Yugoslavian Shepherd Dog, and is a dog breed used to protect livestock in the mountains. Having this important function, it’s no wonder where his protective, guardians instincts come from. The Šarplaninac is a strong dog and a reliable friend that in lack of sheep, will often herd their owners. Whatever happens, this dog will protect you with his own life. This giant dog breed originated in the city of Leonberg in Germany. His lion-like appearance and a baritone bark make him a fearsome guard dog. However, with enough training, socialization and exercise they will become a family’s friend like no other. Also, this jumbo-sized watchdog will need a lot of time to run and workout, so better choose him if you have enough space for his requirements. The Combai dog is a terrier dog breed that has origins from the state of Kerala India. These intelligent dogs make great watchdogs as they used to guard cattle from leopards and tigers. They are also quite aloof towards strangers, and if not trained on time, they might also become aggressive. Today, Combais are mostly used as guard dogs on farms. Don’t let his fearless attitude scare you, as a Combai actually thrives with loving human companionship. The largest of all terriers were originally bred to catch otters and rats in the Aire region. But, it turned out that the Airedale Terrier served their master the best as a watchdog. He might not look as strong as other guard dog breeds, but he is an alert dog that will warn you whenever needed. An Airedale makes a great watchdog that is outgoing and playful with his owners. Canis Panther dog was bred to be the most effective guard dog ever. It is actually a cross between four powerful breeds : Great Dane, Doberman Pinscher, American Staffordshire Terrier and Labrador Retriever. But, don’t let his fearsome appearance fool you, this dog will be very affectionate towards his family. However, strangers won’t have a good time around Panther dog. 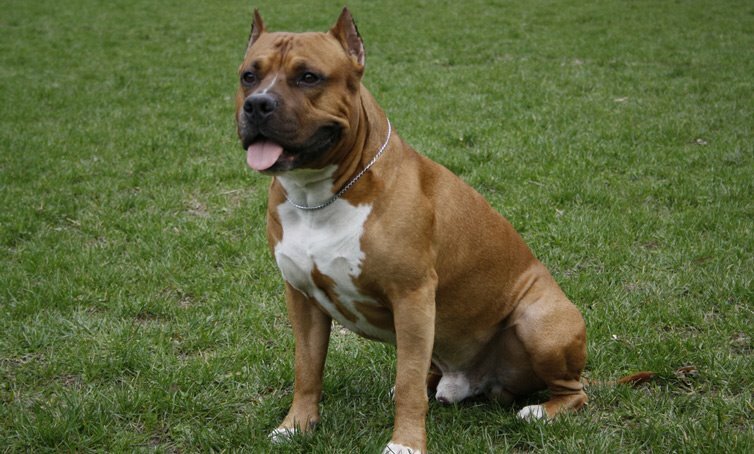 Just like the American Staffordshire Terrier, the American Pit Bull Terrier has a bad reputation for being overly aggressive. This is due to dog-fighting these dogs were used in. Even if they make great guard dogs for their high alertness, they are also very gentle with little children. Therefore, choosing a Pit Bull will not only be a good way of protecting your home, but it will also ensure your kids have a real, loving companion. Kangal dogs are large-sized dogs that were used as livestock guardians in ancient Turkey. They were successful sheep guardians thanks to their appearance and temperament. Kangal dogs were trained to protect their herds from predators and therefore they have inherited these protective instincts. However, this Turkish dog is very gentle with children and will make a great companion dog on farms or freeholdings. Canary dog also known as Canary Mastiff or “Perro de Presa Canario” was originally bred for working livestock. This rare, large dog is the symbol of the Spanish island of Gran Canaria. The Presas were used in dog fighting rings due to their size and strength, and his appearance generally looks a bit hostile. Today, they make great guard dogs that are often very suspicious of strangers and other dogs. If you want to a Presa, you should provide him with proper early socialization and training in order to control his aggression. The Chow Chow is an ancient breed believed to be one of the dogs that were imitated in the stone guardians in front of Buddhist temples and palaces. He is a sturdy, fluffy dog that looks rather as a lion-looking teddy bear than an alert watchdog. And his genes prove it! The Chow Chow dogs were used for long as guardians of their owners’ possessions and hunting dogs. 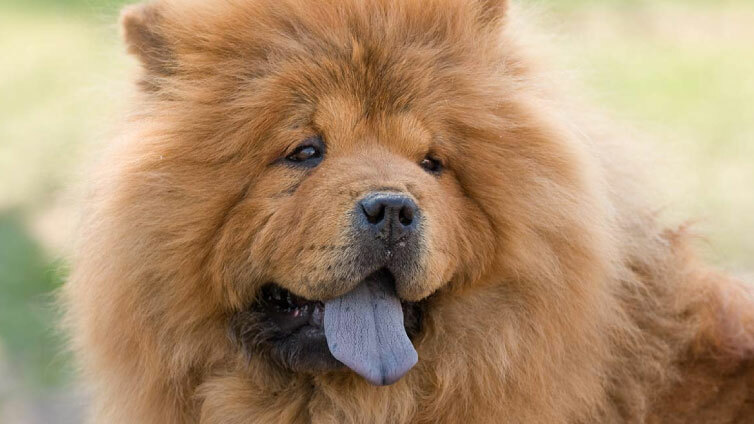 A Chinese legend even says that one Chinese emperor kept 2,500 pairs of Chows as hunting dogs.